Houston is experiencing catastrophic flooding as the aftermath of Hurricane Harvey, which made landfall as a category 4 hurricane on Friday, continues to relentlessly dump rain on the region. Images of heroism and destruction have been making the rounds on Twitter. And so has that damn shark photo. Again. For the uninitiated, there is a photo of a giant shark swimming through inundated streets that pops up like clockwork anytime major flooding enters the news cycle. It’s totally fake. As Snopes pointed out years ago, the great white shark, which appears to be casually swimming down a flooded city street, originates from a 2005 magazine spread in Africa Geographic. It was later photoshopped by hoaxers to make it look like the shark has found its way to an urban setting. 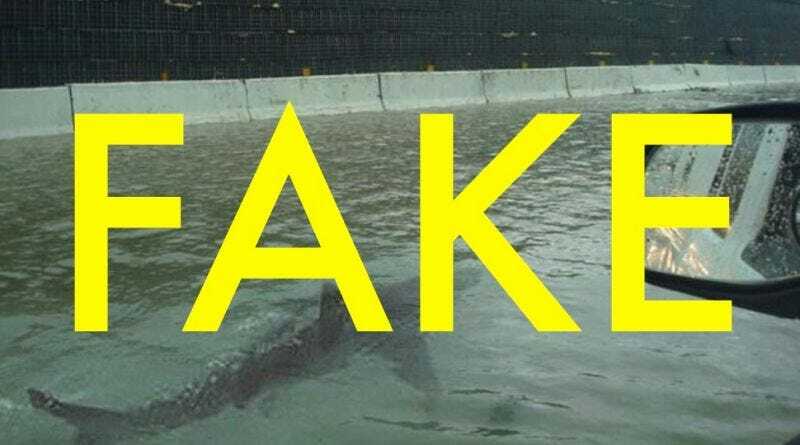 Despite being fake, the shark previously went viral during Hurricane Irene in 2011, Hurricane Sandy in 2012, Hurricane Matthew in 2016, and during flash floods in Texas in 2015. It’s really remarkable that after years of being debunked, the hoaxers still manage to get the image to go viral. The tweet above claiming the shark is swimming down the Houston highway during Hurricane Harvey already has thousands of retweets. Not only are you contributing to the spread of misinformation by retweeting the fraudulent image, but you’re making it difficult for others to separate the signal from the noise in a disaster situation. In the event of a natural disaster, there are a number of productive things you can do like donating to food banks in the area. But please, for the love of god, stop sharing the shark photo.